Blending horror and adventure, The Mummy franchise has existed a long time within the great tapestry of movies and films, dating all the way back 1932 with Karl Freund’s The Mummy and starring Boris Karloff as the titular “mummy” character. While there’s being several adaptations, the premise has remained the same: a cursed ancient Egyptian priest is resurrected, brings forth his wraith upon the world and ensues efforts of heroic archeologists to stop him. While Freund’s The Mummy has become iconic and a classic in the horror monster genre, perhaps the most widely known series of this franchise is with Stephen Sommer’s The Mummy series (1999-2015). Following the adventures of Richard “Rick” O’Connell, his wife Evelyn “Evy” Carnahan, and several others, this series consisted mainly within a trilogy, beginning back in 1999’s The Mummy, which was then followed by 2001’s The Mummy Returns and 2008’s The Mummy: Tomb of the Dragon Emperor. Sommer’s The Mummy series has also spawned a spin-off series (The Scorpion King), which consists of one theatrical film (released in theaters) and three direct-to-video films. Now, in a way of trying to reimaging the iconic “mummy” monster and keeping the spirt of Stephen Sommer’s series, Universal Pictures and director Alex Kurtzman present the first installment in their planned “Dark Universe” with the film The Mummy. Does this reboot of the classic monster find new ground to stand upon or is it a far-cry from what’s become before with this mummified creature? In Ancient Egypt, Princess Ahmanet (Sophia Boutella), the only child of the current Egyptian pharaoh, was destined to rule, but, after her father’s wife gave birth to a son, Ahmanet’s birthright destiny to be Egypt’s future ruler was taken from her. Making a deal with Set, the Egyptian God of Death, Ahmanet allows evil into herself, which ultimately leads her to being mummified and sealed away for all time. Fast forward to present day, Army Reconnaissance Sgt. Nick Morton (Tom Cruise), who makes a little extra money on the side with his best friend and partner Chris Vail (Jake Johnson) by hunting ancient relics / treasures and then selling them on the black market. After one of their missions goes askew, the pair accidentally uncover the forbidden tomb of Ahmanet. 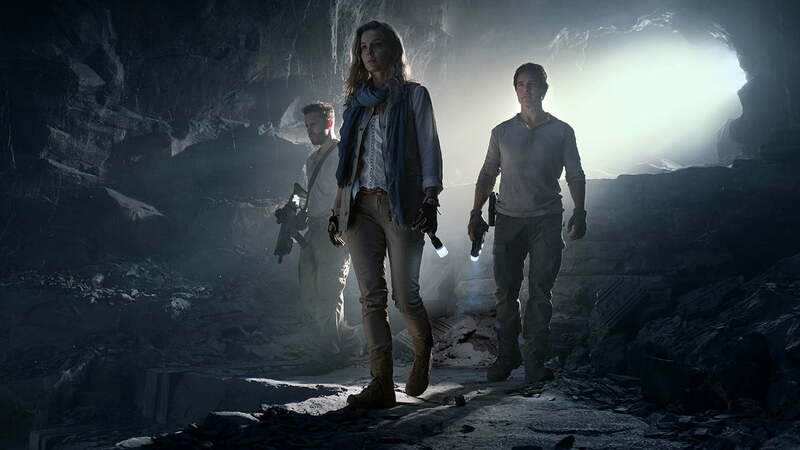 Joined by anthologist Jenny Halsey (Annabelle Wallis), Nick and Vail explore the ancient tomb, stumbling upon the sarcophagus of Ahmanet. Unfortunately, when Nick sets off a series of events that ultimately frees Ahmanet from her eternally prison, tragedy and mayhem begins to befall everyone around him. Freed from captivity, Ahmanet seeks to complete the ritual that would fulfill her deal with Set, but Nick (unintentionally) has become tethered to her plans. To make matters even worse and further complicating the situation is the appearance of Prodigium, a group for which Jenny is employed and, led by Dr. Henry Jekyll (Russell Crowe) is dedicated to discovering and defeating the evils of the world. Facing the full wrath of Ahmanet, it’s up to Nick to find a way to defeat her and the save the world from completing her task. Suffice to say that, the character of the “Mummy” has been a classic feature of cinematic monsters, joining the ranks of Dracula, Frankenstein’s monster, the Werewolf, and others. While I’ve never seeing the original Karl Freund’s The Mummy (or is it follow-ups installments than ran from 1932-1955), I’ve heard that their good and are iconic in their own right as a part of the “classic monster” movies. I have seeing Stephen Sommer’s The Mummy series and mostly enjoyed all the entries. The core installments, which make up the trilogy, are good (the original 1999 film was my best) and, while not these movies are not the quintessential “Mummy” movies, they do demonstrate a certain balance of action-adventure aesthetics that’s combined with fantasy-horror elements. Yes, there a bit cheesy and not the best cinematic trilogy out there, but there’s a certain cult following to them, including myself. The Scorpion King movies, the spin-offs film for this series were “meh” (in my opinion) as I’ve only seeing two out of the four features and have little to no desire to see the other two. This, of course, brings us back to the present with a “new” (reboot and revamped) Mummy movie and the start of a new shared cinematic universe for all the iconic film monsters. In actuality, this wasn’t the first attempt that Universal tried to restart this monster universe as the 2014 film Dracula Untold, which starred actor Luke Evans as iconic Vlad the Impaler aka Dracula, was supposed to the first installment in series. Unfortunately, Dracula Untold, was faced with mixed to negative reviews and underperformed at the box office, collecting only $217 million (globally) and failing the projected target that the studio was looking for. Thus, Dracula Untold was dismissed as part of Universal’s Monster Universe films (just a little backstory for you guys). Anyways, I remember hearing all the internet talk and newsfeeds about a new Mummy movie and was also going to be the start of Universal’s new Monster Cinematic Universe, which is now called “The Dark Universe”. The trailers for the film made it look somewhat interesting, but I wasn’t completely sold on the idea, with Tom Cruise as the lead. However, I was curious to see a female “Mummy” character (and do like Sophia Boutella) as well as to see if this movie can succeed where Dracula Untold failed in both as a standalone revamped monster movie as well as being the foundation for this new Dark Universe series. So, what did I think of 2017’s The Mummy. Well, it’s not good. While the movie tries to offer a new spin on the classic, The Mummy mostly ends up being a stale action / adventure film that fails to deliver on its pre-release hype and notoriety, which does not bode well for being the start of Universal’s Dark Universe franchise. The Mummy is directed by Alex Kurtzman, whose career is mostly in the field of writing and producing feature films such as Transformers, Star Trek, The Amazing Spider-Man 2, and The Island. Given that background of blockbuster type films, Kurtzman seemed like the ideal choice for directing this revamped version of The Mummy, which is his largest film he’s directed in his career. To be fair, Kurtzman does staging everything the right way, which makes The Mummy a decent fantasy adventure / horror flick, especially with certain elements that help propel the movie forward within this cinematic world. To be truthful, there are a couple of moments that are genuinely good horror nuances (the first scene with Ahmanet’s return is probably the best example) and it’s with these scenes that movie achieves greatness. On a technical level, The Mummy is also big and vast, with its various sets and scope on a grand scale to tell its story as well as its visual effects, which bring Ahmanet’s dark power to life. Additionally, the music for the film, which is composed by Brian Tyler, is actually pretty good and fits the mood and underscore tones of the feature. Lastly, there is a reference to the 1999 version of The Mummy in this 2017 version….be on the lookout for it. Unfortunately, despite its attempts to be “biggest and best” iteration of this classic monster film, The Mummy does falter greatly in its undertaking throughout its runtime. Firstly, the film’s script, which was written by Jon Spaihts and Christopher McQuarrie, seems rather “blah” and generic. In truth, a viewer can draw a lot of similarities to 1999 version both in its narrative story (i.e. three individuals stumbled upon an ancient mummy and accidentally unleash it upon the world, then trying to figure out a way to defeat said ancient mummified evil) as well as its trio archetype of main characters, with a charming rogue adventurer (Cruise’s Nick Morton to Fraser’s Rick O’Connell), an intellectual female lover interest (Wallis’s Jenny Halsey to Weisz’s Evie Carnahan), and a comically side-kick (Johnson’s Chris Vail to Hannah’s Jonathan Carnahan). However, while the similarities are present, it actually somewhat hinders this 2017 version as if the movie can’t stand on its own merits and creative originality and trying “woo” his viewers by almost making a carbon copy with the 1999 version (just with different actors and updated visual effects). The movie tries to be somewhat different with a female mummy and the inclusion of Prodigium (more on them below), but these two points don’t really work in the movie’s favor, despite them being somewhat intrigue when first on-screen. The narrative pacing is also a problem within The Mummy, feeling very “by-the-numbers” and almost formulaic, rushing forward in a predictable manner as the film concludes with a climatic ending that feels underwhelming and almost unsatisfying. In addition, the film’s written dialogue feels clunky at times, despite the likeable / recognizable cast saying those said lines, with the main leads usually telling what happens rather than letting the movie (and its action / story plot) do that for itself. It also doesn’t help that the writing is poorly written, with plenty of dialogue lines coming off as cliché and derivate to the adventure / horror genre. Also, the movie does (at several times) interject a lot of uneven tones, switching between moments of horror and some really awkward humor bits, which tries to offer some levity in the movie, but ultimately just falls flat on its face. All in all, there’s really no joy in watching this movie as The Mummy feels more like a hollow and lifeless feature film. Maybe they should’ve started the Dark Universe with Dracula Untold. As stated with this movie, The Mummy is (by design) to be the first installment in Universal’s Dark Universe franchise, with the film’s most notably reference being Dr. Henry Jekyll and the appearance of the Prodigium organization. While it’s an interesting introduction to both and does bring in a large scope to the film’s world (or rather its cinematic universe of monsters), it ultimately becomes a distraction to the story being told presently (i.e. the return of Princess Ahmanet). With the rise of other shared movie universes (the MCU and the DCEU), it’s almost commonplace to want to try and world-build a cinematic “movie-verse” in order to tie in everything together as well as laying the groundwork for future installments. However, too much world building in a movie can be problematic, especially when it’s the first entry in a potential series. Such is the case with The Mummy. Most of the second act of the film, which heavily features the character of Jekyll and the Prodigum organization, drags and feels almost completely superfluous. Yes, the Prodigium angle is slightly interwoven into The Mummy’s narrative, but it does take away from the main plot thread of film and almost feels a bit shoehorned into the movie (forced rather than organic). Thus, their inclusion within the movie’s context, while attempting to broadening this world of gods and monsters, is just bothersome and should’ve been saved for another installment (possibly the second or third of the Dark Universe films). The cast in The Mummy is a small roster, but is populated with very recognizable actors / actresses to play its main characters, starting with actor Tom Cruise, who plays the film’s protagonist character of Nick Morton. While his appeal to the public has waned over the years (especially after his divorce with Katie Holmes and his media outbursts on scientology), Cruise, known for his roles in Top Gun, Risky Business, and Jerry Maguire, seems to be phoning in his role in The Mummy, finding Nick Morton to be uninteresting and mundanely boring to watch (even less to root for). In truth, Cruise just can’t pull off roguish adventurer role. He’s definitely charismatic and has the on-screen star power, but his portrayal of Nick Morton can’t come close to more iconic portrayals like Indiana Jones or even Nathan Drake from the Uncharted video games. Cruise spends most of the movie either running away from something, looking bewildered / confused, or asking someone random questions about what’s going on. Thus, there’s really not much to the character and it just makes the character less impressive. In short, while Cruise does indeed have a on-screen presence of male lead, his character of Nick Morton (and his portrayal) of a roguish scoundrel adventurer falls short in terms of satisfaction and likeability. Following Cruise’s Morton for most of the film is actress Annabelle Wallis as the feisty and intellectual archeologist Jenny Halsey. Wallis, known for her roles in the TV shows The Tudors and Peaky Blinders, certainly looks beautiful and does pull off the role as a female lead in major motion picture. However, her character is a cliché of sorts (in both a female archeologist archetype and a love interest for the rogue adventure), which makes the character of Jenny Halsey bland and generic. Additionally, Wallis’s chemistry with Cruise’s Morton starts out a bit strong with the pair exchanging witty banter with one another, but it becomes, much like the movie itself, hollow and lifeless. In short, despite myself liking Wallis as an actress and seeing her in a major movie, her character is uninteresting and vanilla as there’s not much that she nor the film’s writers bring anything new to the archetype persona. Similarly, the character of Chris Vail, who is played by actor Jake Johnson (The New Girl and Jurassic World), can’t break the stereotype mold of being the designated comical “buddy” sidekick to Cruise’s Morton. Again, this just makes the character less interesting, despite being played by likeable actor (this seems to be reoccurring theme throughout the main characters of the film). As for the character of the “mummy” (Princess Ahmanet), the role is played by actress Sofia Boutella, who is known for her roles in Star Trek Beyond and Kingsman: The Secret Service. Personally, Boutella does do a good job in the role, bringing the right amount of striking, yet haunting beauty to Ahmanet and has the acting chops for it as well. However, the problem with Ahmanet doesn’t like with her portrayal, but rather in the film’s script. Yes, it’s a bit of a departure (in both the 1932 and the 1999 version) to feature a female “mummy” character rather than Imhotep (a male character). It also interesting that the character of Ahmanet is a princess and isn’t tethered to a love story of any kind…she just an awful person who desires power for a destiny that she was denied from. Unfortunately, while the sounds cool and does seem like an intriguing setup for a villain, the character of Ahmanet doesn’t really go anywhere after her initial introduction. She certainly does look cool (thanks to Boutella’s natural look and the make-up department) and does wicked things throughout the film, but there’s not much to the character, which slowly begins to fell bland and unmemorable. Thus, Boutella’s performance of the evil mummified princess is fine and while interesting at first becomes less and less as the movie moves forward. As a side-note, I think it was pretty stupid (and kind of cheesy) that Ahmanet does speak English in the movie at various points, which sort of dumbs it down for audience. It would’ve been so much cooler if she only spoke ancient Egyptian. 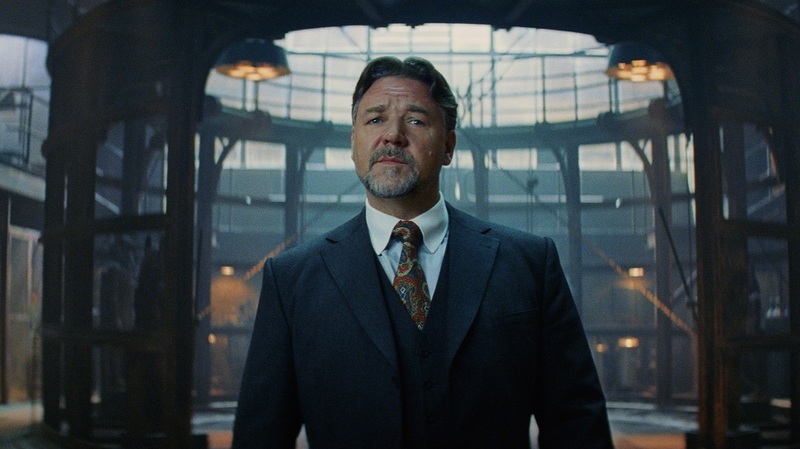 Rounding out the cast is Oscar-winner actor Russell Crowe as the enigmatic scientist and leader of the Prodigium organization Dr. Henry Jekyll. Like Boutella, Crowe, known for his roles in Gladiator, A Beautiful Mind, and Les Miserable, does a fine job as the iconic fictional character of duality (yes, he does break out into his more menacing role as Mr. Hyde in the movie), but the character presences in The Mummy is, more often than not, just to narrate and share expositional dialogue to both Nick and Jenny as well as introducing himself as a future player in the Dark Universe franchise. Thus, Crowe’s Jekyll doesn’t amount to much beyond that and feels more shoehorned into the movie rather than a working cog in the film’s narrative mechanics. Also, it’s kind of hard to see past the parallelisms that The Mummy makes with superhero realm of the MCU, with Dr. Jekyll as Director Nick Fury and Prodigium as the S.H.I.E.L.D. organization. Lastly, with the exception of Courtney B. Vance (Office Christmas Party and The Hunt for Red October) as Colonel Greenway, The Mummy really doesn’t have supporting cast members, with much of the screen-time devoted to its main principle cast. Princess Ahmanet has reawakened from her eternal prison and it’s up to characters Nick Morton and Jenny Halsey to thwart the ancient mummified princess from unleashing her chaos upon the world in the movie The Mummy. Director Alex Kurtzman newest film offers some genuine horror moments that’s mixed with big blockbuster action and big star power for its main characters as well as being the start of its shared cinematic universe of monsters and gods. Unfortunately, the movie ultimately fails to impress and underperforms poorly due to its formulaic narrative, weak script (and dialogue), and undeveloped / cliché characters. Personally, I thought this film was a cross between “meh” and bad. After seeing so much marketing promos for this movie and being hyped for a start of a classic monster cinematic universe, it’s pretty much a letdown. There’s some stuff I liked about it, but the glaring negatives definitely outweigh the few positives I had for it. Thus, my recommendation for this movie is a hard “skip it” as there’s really not much to the movie beyond its initial premise and its big-budgeted production flavor. With The Mummy not being the slam dunk success they (the studio heads at Universal) were looking for, it is ultimately unclear on how the rest of their Dark Universe will ultimately play out, with the next installment being planned for The Bride of Frankenstein (a release date set for February 2019). Unfortunately, with staring point being The Mummy, this fantasy / horror franchise is already standing on shaky ground. This remake really disappointed. It was trying to be so many things at the same time, some of which also do not make sense. The whole Dr J and Mr H thing also felt incongruous. I agree with you. If the movie’s focus was more on the actual events of the movie (Ahmanet’s return) and didn’t get bogged down in trying to build up its own cinematic world, the movie could’ve been better. Unfortunately, that wasn’t the case. Plus, it didn’t help that the movie itself was big cliché from its narrative to its character archetype with virtually nothing new being brought to those respected fields (the exception being making the character of the “mummy” a female one). Fine review. I disagree with the “skip it” sentiment though because if you leave your brain at the door this has enough action, horror, stunts and suspense to please lots of people. In fact, while it’s very generic with haphazard plotting it is no worse than blockbusters like A Force Awakens (2015) or Fast and Furious 7 (2015) or Mission Impossible 6; which are all a bit dumb but very professional, entertaining action films. I would say though that Tom Cruise probably unhinged the story slightly with his “superman” persona and a less well-known actor may have added a bit more suspense. However, his characters’ arc was actually quite interesting as a cursed thief questioning his actions. The end pay off was actually quite satisfying too. Thanks for reading and commenting!!! Well, as they say “Beauty is in the eye of the beholder” as some people find The Mummy enjoyable and liked various parts from it. However, for me, I just couldn’t find the entertainment value to it. Sure, the narrative was structure for The Force Awakens was too similar to A New Hope and Furious 7 was a bit haphazard (though you still have to given them credit for completing the movie after Walker’s death), but at least they were entertaining and fun to watch. To me, The Mummy just wasn’t and could’ve been something more than what it was. As for Cruise….yes, I did like the whole curse on him (it was an interesting angle), however Cruise can’t pull it off and it didn’t help the character was generic. If the character isn’t interesting and the actor’s ability to charm viewers isn’t there, then on-screen portrayal of that particular character is doomed to fail. Fair enough mate. I respect your opinion. I agree that Cruise was, while decent as usual, top-heavied the story away from the horror direction I think they should’ve taken. However, swimming monsters, smashing planes crashes and bone-snapping ghouls made it pretty entertaining all-round. What I’m saying is, and we can agree to disagree, is it’s no better or worse than other less critically mauled blockbusters. A similar fate befell John Carter (2012), a few years ago, which for some reason got a critical pasting when it was no worse than other franchise/genre films around. Well, between the two of us, at least one enjoy the movie (and that’s all that should matter). Also, I agree with you on John Carter. Awful, one of the worst films so far this year, terrible script and wooden performances all round except for Boutella. Thanks for commenting. Well, I wouldn’t say its the worst movie I’ve seen so far this year, The Mummy is definitely going to be in my top 10 worst movies of the year list. The movie had potential with an interesting first act and with Boutella as a female mummy. However, like you said, the performances were shallow, the script was weak, and the story wasn’t really compelling. I know and agree. This movie could’ve been something more than what was. Unfortunately, what we get is a flawed final product. I do wonder how this will affect the rest of Universal’s plans for their Dark Universe franchise.